Hayley is quite honestly the best photographer we could have ever wished for! We had a pretty chilled out, low-key wedding so wanted somebody to capture it in the best way possible as we were worried our venue wasn’t the best place for wedding photos. What we got back, was unbelievable!! She even found a place behind the hotel kitchen, and made it look like we were somewhere in the Lake District..honestly!! We never even noticed her at the wedding, but somehow she managed to capture so much! We have had nothing but complements about the photos and how amazing she made them look! We really could not recommend her anymore if we tried. From the moment we submitted our enquiry through to receiving the photos, Hayley has been an absolute pleasure to deal with. She is THE most loveliest person - instantly making you feel relaxed. Hayley is organised, helpful and just so amazing. We had the most fantastic pre-shoot photos which we absolutely adore and our wedding photos are simply stunning. We can't express just how good the photos are! Everybody we have shared them with have commented about what a superb job Hayley has done. It's impossible to choose favourite photos to go on the wall - they're all so superb! My husband and I even commented how we missed Hayley after our big day was over! We could not recommend Hayley enough - her professionalism, quality of work, communications and general loveliness could not be better. Hayley was worth every single penny and more to capture photos that we will treasure for a lifetime. Thank you again for everything and for being so amazing. Well, where do we start? Hayley you were incredible on our wedding day! Choosing a photographer can be such a difficult decision as it’s the part that will be captured forever but after seeing your natural approach and exquisite photos, we knew instantly that we wanted you to capture our day! You were incredible throughout the entire day, you put everyone at ease and really thought ahead with single every shot. The pictures are absolutely incredible! We are so grateful to you, and would highly recommend you to anyone that ever needs a photographer for any event! Hayley Hayley hayley.... we don’t even know where to begin! You were an incredible part of our wedding from start to finish! After stalking through your photos, seeing the natural shots you capture, we knew you’d be perfect. We were in love with our pre wedding photos and you made us feel so relaxed and at ease... but the wedding photos were better than we could have ever imagined!! We were hardly away from our wedding guests and people barely noticed you, but you got all the best shots of our day perfectly!! Not just an amazing photographer, but an amazing lady as well! One of the best decisions we made for our wedding day, was booking Hayley as our photographer. We knew straight away that we had to book Hayley and she was one of the first things we did book. We fell completely in love with her work and no other photographer came close. We just loved how all of her pictures looked really natural and how relaxed the couples and their guests looked in every picture. That is exactly what we got!! I really love how she manages to capture those moments, when you are in the moment, it really is beautiful. From start to finish and even now six months after our wedding, we are blown away by Hayley’s amazing work. She is such a lovely person and has a down to earth personality and she really knows how to make you feel at ease. She goes above and beyond to find those special places for your photographs. One thing we still comment on now is how thoughtful it was for Hayley to drive us to the lake for some of our pictures, so we could spend that time together and she got an absolute cracking shot on the jetty! I really don’t think there are enough words to describe just how amazing this lady is and we highly recommend that all future couples book Hayley. You would be so lucky and would have some truly amazing pictures to treasure forever. We will definitely be booking Hayley for any photo shoots we might have in the future. 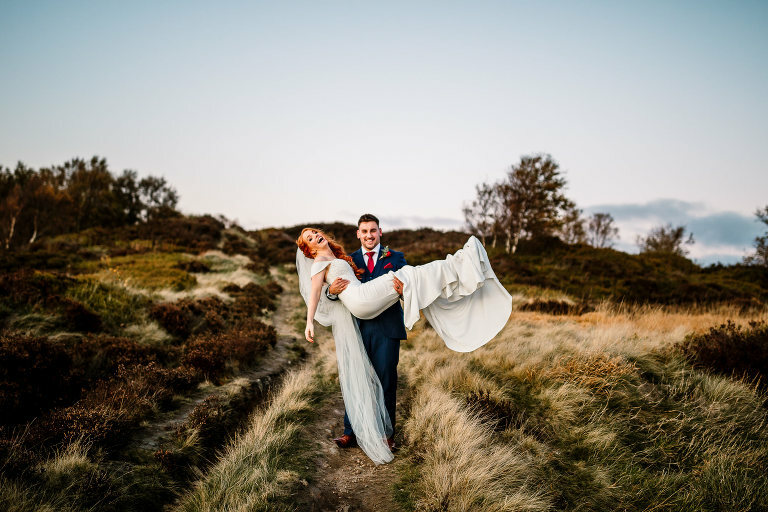 We knew from the fact that she credits herself on being “relaxed, genuine and importantly unobtrusive” that she was the photographer for us, and this is exactly what she delivered! Everything was perfect, from the communication, quick turnaround and near 800 shots of pure gold that will treasure forever. The photos tell a story and bring back every feeling from our wedding day. We look at them feeling every emotion all over again. Hayley is a serious talent! From the Pre Wedding shoot to the Wedding itself she has captured beautiful images that I still can’t believe we are part of! The kind of images I’d admire from afar, the kind that stop you in your tracks. We’ve had comments such as “the most beautiful wedding pictures I’ve ever seen” and we completely agree! Hayley totally ‘got’ us and our relaxed wedding & that was a great feeling on the day. All our guests loved her & so did we, a truly genuine & fab lady! Put simply, Hayley is perfect & from start to finish was the only part of our wedding that gave us zero stress. We met for a pre wedding photoshoot to get to know Hayley & get over the initial nerve's of being photographed, she was so kind & immediately put us both an ease. She completely understood the style of photos we were hoping for and definitely delivered. I remain in awe at the beautiful photos she has produced and have looked at them everyday since receiving our beautiful package. Within minutes of viewing Hayley's website I was sold without even talking to her - I emailed her waiting with baited breathe hoping she would be available & shortly after received a bright and bubbly email and became even more certain of our choice! We immediately fell in love with her style of photography and how beautiful & relaxed all of her photos were - we spent a long time scrolling through her lovely blog. I can honestly say I would've paid her the earth to have her capture our day! Hayley’s work is like no other – she has created the most perfect memories that we can treasure always. She was not just a fab photographer – I think i have gained a friend & I couldn’t imagine using anyone else. I dont like having my photo taken and I’m not photogenic – but i knew Hayley would make me look unbelievable & I wasn’t disappointed! Hayley went above and beyond in every aspect – so professional but I felt like a close friend was photographing us, I felt so at ease with her and the quality of her work blew everyone away! She is an amazing artist who made our wedding look like something out of a movie! I just love her – not just amazing at her job but she is also a fab person! But physically the only memories are captured by your photographer. We were lucky to have someone as amazing as Hayley – we weren’t camera confident, nor did we want to spend our special day posing but she captured every element of love & happiness of our day without being staged and for that i will be forever grateful. I cannot recommend Hayley highly enough. Any couple wanting their memories captured perfectly should book her - it will be your best decision! I was absolutely over the moon with our photographs, Hayley’s relaxed and beautiful style is everything we envisioned. They are beautifully shot, edited and create the most amazing timeline of the day capturing everyone’s emotions naturally. Hayley has the most amazing quality of catching those little smiles, little tears and perfect moments of the day. Not only a talented photographer she was fabulous on the wedding day and in the lead up to the wedding. So supportive, professional & interested in our vision. We have received so many wonderful compliments about our beautiful photos – and how helpful & easy to work with Hayley was on the day. We cannot thank Hayley enough and feel that everyone should recognise the wonderful talent and wonderful person she is! Thank you for being so wonderful, talented and most of all a really lovely person! Photos are very important to Steve and I, and we are so pleased that we found you! You really listened to what we wanted - photographs that were natural, not posed or staged and captured the love and happiness of our day. We really appreciated being guided through the pre-shoot so we knew what to expect on our wedding day, and you were not afraid to use your vision to capture some wonderful wedding shots we will treasure forever. For anyone looking for the best wedding photographer, we cannot recommend Hayley enough. Such a tremendous talent!